This lesson reminds me of my work with grade school children. As an educator, you quickly become familiar with those children who’ve learned to “act out” for attention. Their reasons may vary, but their motive is the same: Disrupt by any means necessary. My learning experience has been unique when it comes to classroom management. In an average classroom a teacher could have 2 or three disrupters. I’ve been so lucky to have had experience with nearly 10 times that many in one school year, and in one classroom. As emotionally taxing as it was, I learned that children will always express whatever the adults in the room expect of them. If the adult expects misbehavior, they will misbehave. If the adults expect that they will show effort, they do. And simultaneously, whatever the adults place focus on in a child, the child will express more of. For example, when a child is praised more for their kindness towards classmates than they are criticized for misbehavior, they will find ways to be more helpful, which could lead to less disruption from that child. Even in the classroom, whatever I focused within each child is exactly what they showed more of in behavior. The more consistent I was with my recognition of their good qualities, the more their behavior improved. It made no sense for me to resist their bad behaviors by bringing unnecessary attention to it. Not only would it interrupt the moment for those kids who are on task, but it would only make the disrupter misbehave more. Instead, as I shifted my attention towards what I wanted to see more of from them, it neutralized their bad behaviors and made them step up to the plate so that they could be praised for their good instead. The beauty in this lesson is that it can be applied beyond the classroom. In fact, it can be applied in every area of ones life. 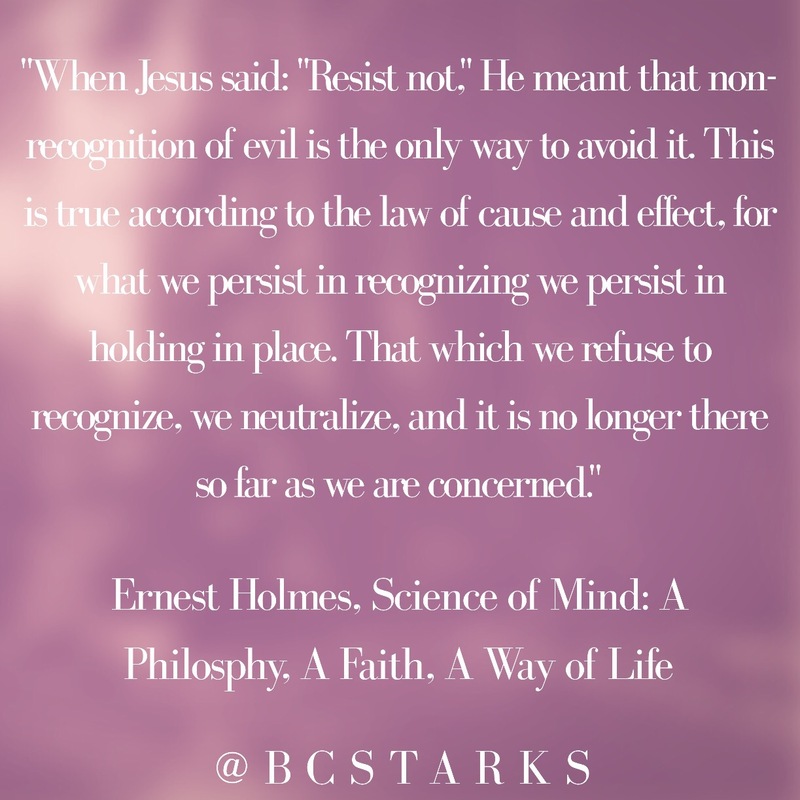 When Jesus said “Resist not…,” he didn’t mean that negativity wouldn’t exist. He knew that life was all encompassing, and that for every positive it’s opposite would exist. But what he also knew is that what you focus on most is what you will attract. And what you don’t give your energy to must flee. According to Holmes, we’ve been trained into expecting the worst, when our very nature is to EXPECT THE BEST. And the latter is what we should do ALWAYS. Here’s Why Every Relationship We Ever Have Is SO Important! Its always so easy to play victim or to feel like life is happening to us that we tend to forget that when it comes to interactions, it takes two. The energy that you put out, is the very thing that you will get in any interaction. I love this passage b/c it reminds us to focus on love instead of fear, because its the only thing that truly exists; everything else is just an illusion to distract us from the face, goodness, and mercy of God. And those are the things that seperate us from our “Christ-like” ways. A Course In Miracles teaches us that we, like Jesus, were created in God’s likeness (even our thoughts mirror His when we focus on love). The only difference is that we learned to be fearful, which takes on so many negative expressions in life that we often choose wrong. To “sin” merely means to “miss the mark” or to “choose fear over love” and nothing more. In any instance we can choose to be a force of Love or a force of fear. God does not punish us for choosing wrong; for when we choose fear, we are choosing to be in pain. When we choose Love, we choose to heal and be of God’s light. God is not a punishing God despite the teachings of some religions! Instead, he’s always there waiting for us to realize how much he Loves us, and how much he needs us to love ourselves and each other in order to do his will. Thank God for His mercy on us that everyday that we awaken, we have the ability to choose again… we have the chance to choose Love and have evidence of it show up in the form of our relationships and our overall lives on Earth. Amen!